This NFL Films presentation is one of the best documentaries on the sport. Fantastic history on the beginning process that is now one of the world’s largest sports top. Narrated by Peter Coyote, and part of a fifteen part series, every aspect of our beloved football is covered. The first beginnings of the sport were born in a painful process, and surprisingly, from people that initially didn’t know much about the game at all; but eventually became their passion. 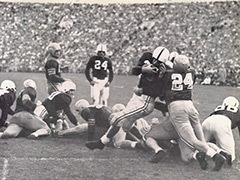 The sport of football changed the way America viewed race in the country, and eventually changed the tradition of how people supported and viewed the game. All of the best names are premiered, with their famous history making plays and famous spend to the top.